Cats and watches go together like, well, cats and anything else. Which is to say that if a cat is disinterested in something (generally everything unless it's flying, a box, food, or your computer keyboard when you desperately need to work), it will ignore that thing. And so it is with watches. Cats couldn't care less. 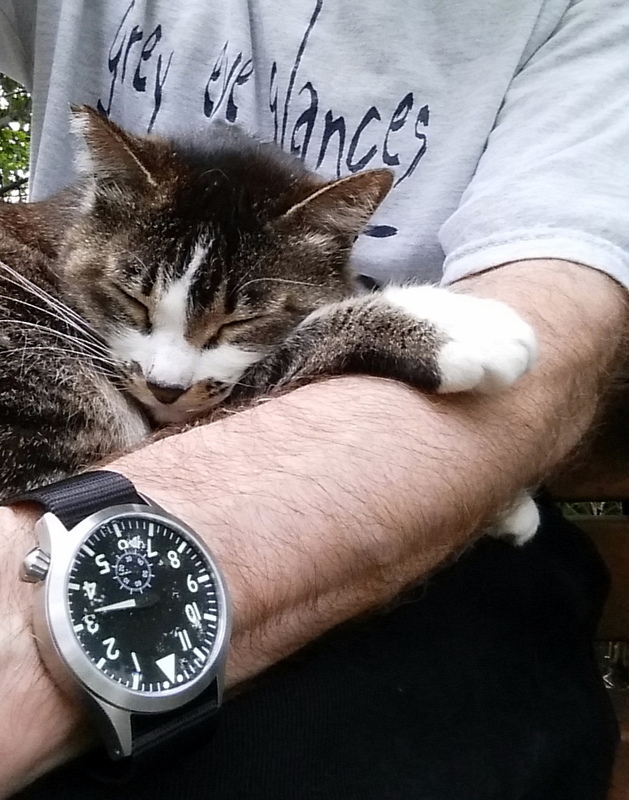 The good news is that cats and watches make for cute pictures. In the park that's adjacent to my apartment building lives an outdoor cat who's unlike any cat I've ever known, indoor or outdoor. This cat is delighted to spend as much time on anyone's lap as they'll allow. All you need to do is sit down on a bench and if the cat, whose name is Kinmo, sees you, he'll hop on and turn your lap into his favorite bed. Every now and then, Kinmo and my arm are aligned like planets showing off to the sun. This allows me to take a passable photograph of the watch I'm wearing that day with Kinmo. Today I had on a Maratac Pilot Automatic (mid-size), which he ignored. 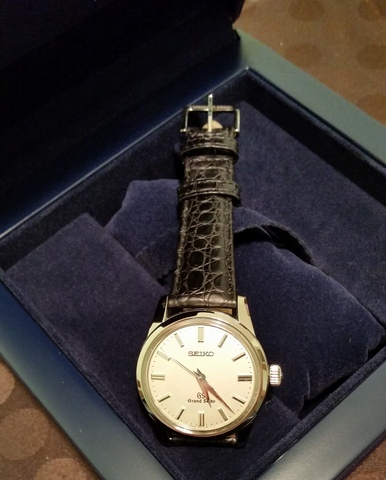 But here's why you shouldn't ignore this watch. Before I describe this watch, take a look at the photo. Do you notice anything different about this watch from just about every watch you've seen or owned? Give yourself a few seconds before reading more. Make a cup of coffee, first, to energize your brain cells, should that help. Need a hint: It's not something the watch has, but what it's missing. Did you guess? The Maratac Pilot has no logo. No branding. There's nothing on the watch to tell you who made it. Mysterious, isn't it? The watch's allure doesn't end with its unique absence of branding. It's also is sold by CountyComm, a business that manufactures and sells a variety of tactical gear to the United States government. The non-branded Maratac Pilot watch was requested by one of CountyCoFmm's government clients. Which one? They don't say. Hmm. 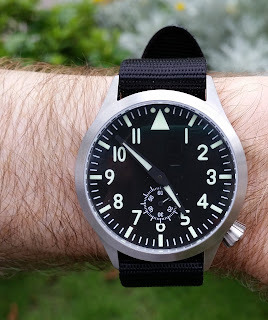 The unbranded, date less Maratac Pilot. The Maratac Pilot watch comes in two sizes: 46 mm and 39 mm. Both are 12.5 mm thick. The Maratac Pilot features a domed sapphire crystal, screw down crown, and SuperlumiNova hands. Both sizes use a Miyota 8245 21 jewel automatic movement, which is non-hacking. Water resistance is rated to 10 ATM. The Maratac gives you a 40 hour power reserve when not in use. It feels and looks good on your wrist. The Maratac feels not just solid and sturdy, but accurate, too. Accuracy isn't something that you ordinarily feel, yet with this watch you seem to. The Maratac Pilot isn't a brick on your wrist by any stretch of the imagination, but it is a watch that is going to tick away just fine no matter what punishment it receives. Even a cat's claws. It's a fast watch to read, too. The Maratac Pilot is sporty looking, but its starkness would make it a suitable watch to wear under a jacket, as well. The onion crown at the 4 o'clock position contributes to the Maratac Pilot's cryptic, attractive look. 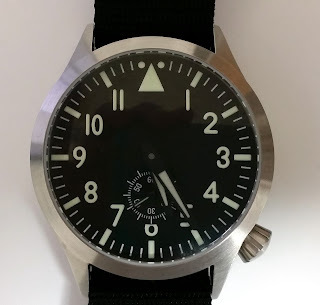 Here's the final interesting fact about the Maratac Pilot watch: The 46 mm version is only $289, and the 39 mm Maratac Pilot Mid is $299, making these two watches a great deal.